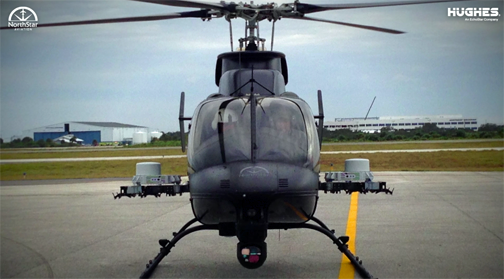 Hughes Network Systems, LLC (HUGHES) recently demo'd a 360-degree Beyond-Line-of-Sight (BLoS) SATCOM capability transmitting HD video through rotating blades on a NorthStar Aviation 407 Multi-Role Attack Helicopter via the firm's Defense and Intelligence Systems Division (DISD) . This new advancement in SATCOM technology integrates the Hughes HM200 airborne modem and two lightweight antennas mounted on top of the helicopter's weapons platforms via an easy Roll-on/Roll-off installation. As a new lightweight capability— 50 percent lighter than previous systems— it can be adapted to any helicopter platform given its low Size, Weight and Power (SWaP) properties, giving pilots more flexibility and uninterrupted transmission of full motion HD video over a full 360-degree range. The two advanced airborne terminals have very low SWaP constraints, providing an industry-leading capability enabling NorthStar Aviation to quickly place the antennas at strategic low-risk locations on the helicopter without costly structural changes and re-certification. As result, users have the flexibility to integrate the 360-degree solution on an ever-growing variety of rotary wing platforms for missions that range from ISR gathering, to search and rescue, disaster relief, and other applications requiring live video feeds for situational awareness.